Mighty Grocery offers a bunch configuration options which allow customize application to your taste. To open Options screen, tap Menu button of your phone and choose Settings > Options. Small / Medium / Large. Move checked items to the bottom – Configures whether items will be moved below cart separator in the bottom of the shopping list when item is checked, i.e. placed in cart. Shows or hides checkboxes on the left of items in shopping list. 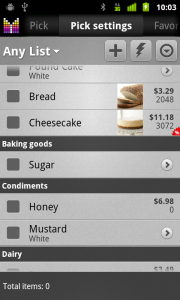 Configures whether shopping list items are crossed-out when checked, i.e. placed in cart. Activates or deactivates Details mode. In details mode when you add an item, Item Details activity will instantly appear to allow you change quantity/units/price without any extra clicks. None — nothing happens on single-tap. Cross out — item is placed in cart with single-tap. Edit details — Edit details screen shows up on single-tap. Long-tap cross out — i) nothing happens if item single-tapped in central area; ii) item is placed in cart if row is long-tapped; iii) popup menu shows up if item is long-tapped on the right side of the row (spot with (>) sign or with price/quantity info). If activated, the phone screen will remain active and will not get locked when phone’s Off button is pressed. 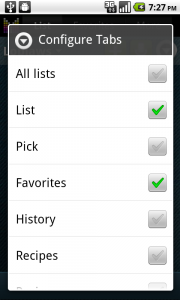 Both changes affect List and Favorites tabs. Warning: This option should be used with caution to not allow unauthorized access to your phone. If activated, shopping list screen won’t change if phone is rotated. This is convenient during shopping to prevent screen from flickering. Full version only: allows turning off ads in the app. Configures a set of tax rates which can be used in Edit Item Details screen. Tax rates is a plain text field which should contain number(s) only. Use line break to add several options. Specifies formatting mask for amount field in case standard currency format is not suitable. “%” can be used as placeholder for number. Leave this option blank to use currency formatting from your phone settings. Configures whether Checkout button requires single- or long-tap in order to move items from cart to history. Used to prevent accidental checkouts. If set to ON, will show full item comment in shopping list. If set to OFF, only yellow mark will be shown in the upper-left corner of an item with comment. Configures if quantity of item should be shown if it equals 1 each. If option is ON and item quantity is 1 each, it will be replaced with (>) icon. If activated, it will be possible to have more effective space in shopping list by shaking your phone. When phone is shaken, Tab bar and Toolbar are hidden thus allowing more items into the screen. Shake again to bring Tab bar and Toolbar back. 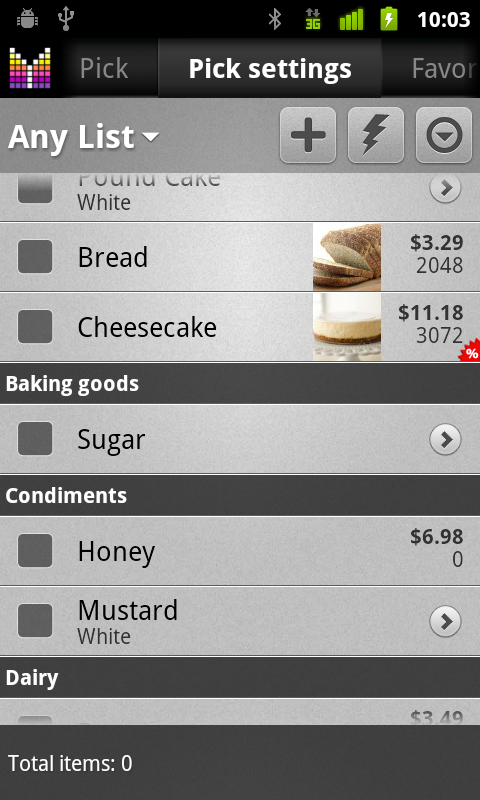 If activated (default), any item added to a shopping list or history will also be added to Pick list. Therefore item can be reused next time you need to add it to a shopping list. If this option is Yes, then you will not be requested to confirm after you add items. Though this might be challenging since voice recognition might involve errors. If this option is No and you add an item using voice, all other items will be hidden and you will be prompted to confirm the latest item added. Same as for confirming voice items, but item confirmation will be required for items added using keypad and touch screen. If activated, scanning barcode in shopping list will add a new item without opening Edit Barcode screen. Cents — comma-separated list of words which will be considered as indicator of fractions of price amount. Articles — comma-separated list of words which will be considered as “1 ea”. Prepositions — comma-separated prepositions which follow units and therefore ignored. Speech recognition parameters can be reverted to default values with Reset option. Sends email to Mighty Pocket Team which contains information useful for debugging application issues. Please add your description to explain what exactly needs to be fixed/improved. 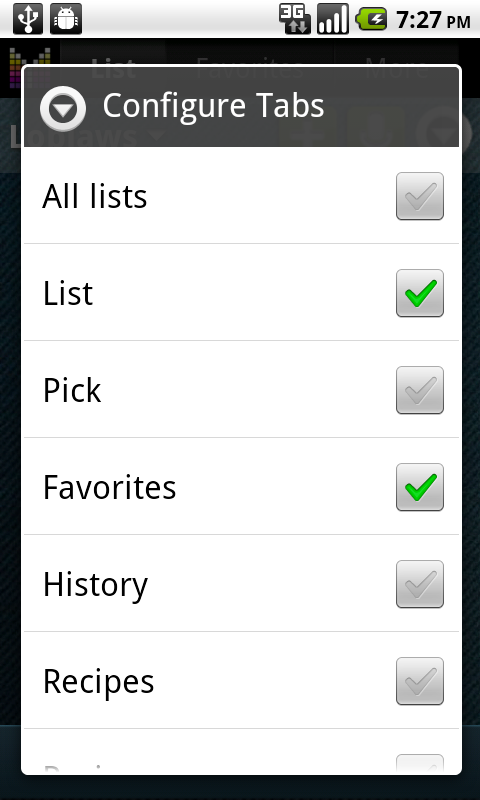 Pick list configuration is available under Menu > Settings > Pick list or by clicking Gears button on Pick list screen. Automatic picks – product items created from shopping lists, history, etc. My picks – product items added manually. 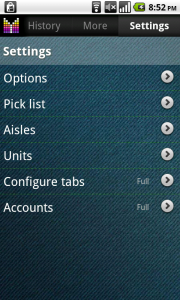 Tap Side Menu > Sort and filter > choose Predefined Catalog. This step is required so that imported items would end up in Predefined Catalog category. 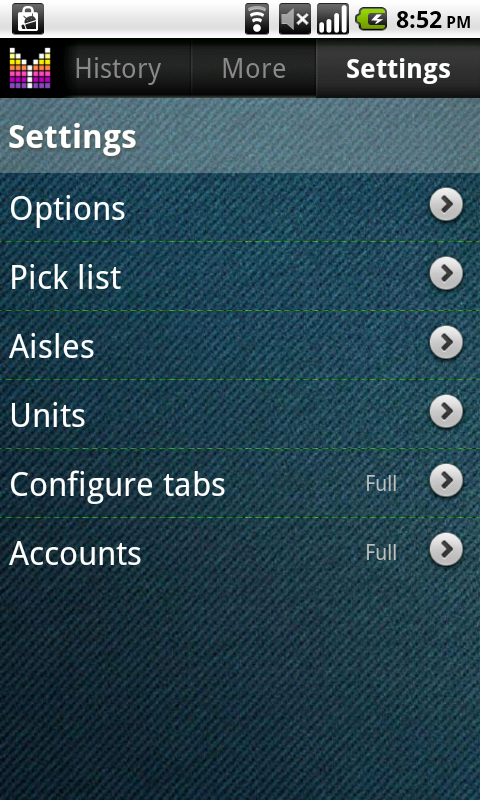 Tap Side Menu > Delete Presets if you would like to remove existing non-used products. Otherwise you may skip this step. Tap Side Menu > Import. Select a language for import. Since you don’t want to manually input text into the box, the better way is to open a file and copy its text beforehand. For instance, the file can be transferred via USB to your SD card and then opened on the phone. Or the file can be sent to your phone as an email attachment. Prepare a file with each product in a new line and formatted as Aisle,Name,Details. Give your file the .txt extension which is more likely to get opened by one of the text editing apps on your phone. Send the file as attachment via email and open the message with your email client on your phone. Open attached file with text editing app on your phone. Long-press the text and select Copy All. Open Mighty Grocery and go to Pick list –> Menu –> Import –> Custom. Configurable measurement units to add/change/hide measurement units and provide desirable increase/decrease rate. Go to Settings –> Units and adjust units to your needs. 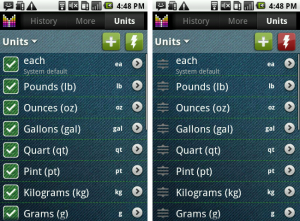 If you need to reset Units configuration or populate units of different language, tap Reset and choose desired language. Configurable tabs feature allows showing & hiding tabs in the Tab Bar on top of the screen. Go to Menu –> Settings –> Configure tabs. And set check against the tabs you want to be visible on top of your main screen. By the way, long-tapping the Tab Bar will show the list of all available tabs, thus making it easy to navigate to any tab of the app. Is there a way to change the name of a list? I would like to change the list name “groceries” to just plain “shopping”. Is it possible to disable the checkout summary? 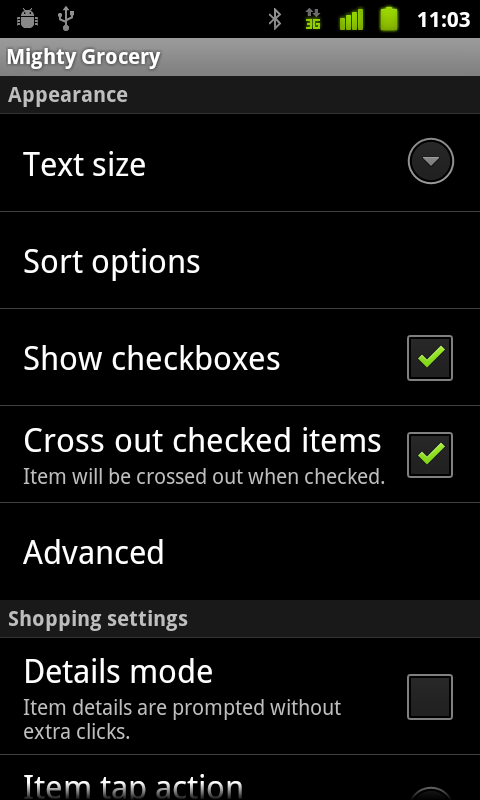 Yes, just disable the following option: Settings > Options > Advanced > Show checkout summary. What exactly are the base units and base ratio functionality under the unit configuration? Best explained in example: Base Unit of Gram is Kilogram. Base Ratio is 1000. This affects items in shopping list: if unit is grams, item’s unit price will be expected in kilograms such as 1.99 per kg. Hopefully this makes sense. Is there a way to edit the Pick List from the web? Mine is messed up and it’s very tedious trying to edit everything 1 at a time. Unfortunately, there is no way to edit Pick list on the web at the moment, but we are woking to make this feature available soon. 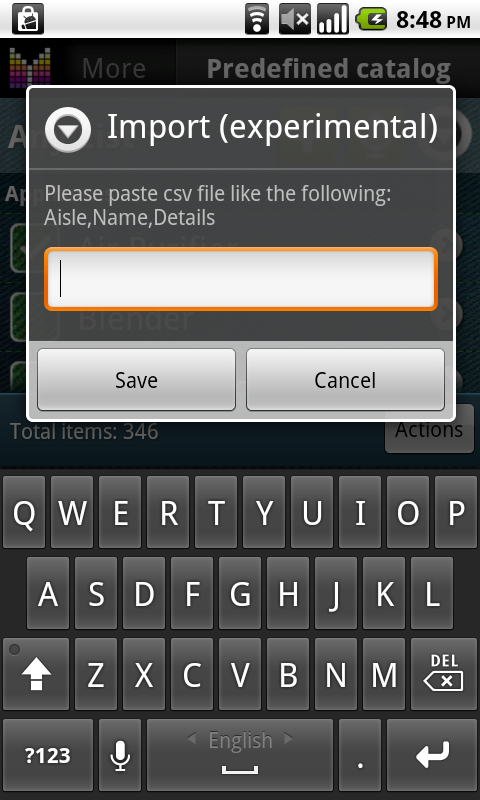 In the meantime you may want to create a CSV file and import it in the app. If I untick the ‘Cross out checked items’ in Options, then check an item in the shopping list, the item is still crossed out and moved to the cart. Any comment? Ronald, thanks for the heads-up. It looks like a glitch in settings. The item will be crossed-out even though the option is configured otherwise. Will plan fixing this in the next update. Most states have different tax rates for food and non food items. I am looking for an app that will allow me to enter the price while at store FAST! Select which tax rate and provide a running total so I can see total cost with both taxes and provide the list of all entry’s so I can review my list. List should reflect the order I entered the item as I put it into cart… Can you make this app do this?? Would pay 5.99+ for an app that can accommodate this request. Cody, you can have multiple tax rates in Mighty Grocery. Just enter as many lines as you need under Menu > Settings > Options > Regional Settings > Tax rates. Then you can tap Tax rate field of an item and quickly change its tax rate. As for item order, the app allows you to sort items manually (Menu > Settings > Options > Sort options > uncheck Group by aisles and Sort by name), however items will be sorted in the order you added them to your list. You can change order of items in Edit mode by dragging-and-dropping items. We may consider changing item order according to checkout order going forward. To would be nice if you and your wife could sincup so she could send you item to get or you could add to her list. John, thanks for your feedback. 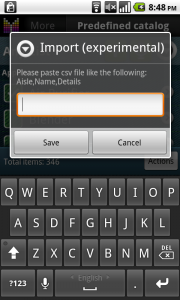 Kindly note that it is possible to sync grocery data between accounts in Mighty Grocery. Please see Sync list User’s Guide for more details. I am trying to import a custom catalog. However, I don’t see from Pick list – > Menú, the next Import option. Is there any other way to get my phone’s custom catalog into my tablet? Jose, if you are trying to transfer pick list from one device to another, the best way would be creating backup on one handset and restoring backup on another. For more details please see Sync with cloud User’s Guide. I want to attempt to import a product list, but am unclear on the effect. If I import into the “All List”, will the import erase those items already in that list? Mark, thanks for your question. No, existing items won’t be deleted if you import CSV file in Pick list. Mark, it is recommended to use Owner access to your account on your handsets. 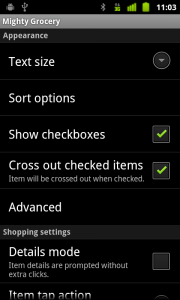 If your devices don’t sync shopping lists, please make sure that you are signed in to the same account on your handsets. Units relationship does not seem to work with pantry. 1: Set unit relationship between liter, deciliter, milliliter and so on. Expected result : rice has green status since more than needed is available in stock. Thanks for creating the best shopping list app out there. Aron, thanks for your feedback. 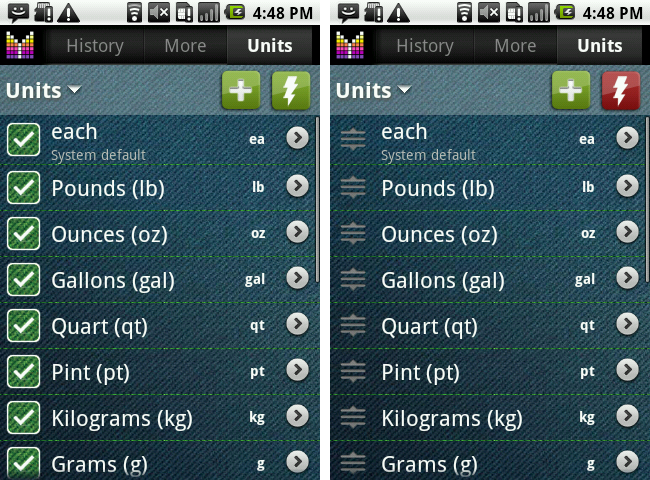 Unfortunately, the app does not handle units relationship the way you expect. We may consider adding this feature going forward. In the meantime for planning to work properly, items need to have the same units. Until the bug is fixed, the stock feature is not usable in my opinion. Don’t you agree? Tiffany, thanks so much for the details. I wouldn’t explain better. Aron, we realize inconvenience with units conversion between recipes, pantry and shopping lists. We plan to make things easier going forward. Thanks for your feedback.